November 11-12 at George Ignatieff Theatre! 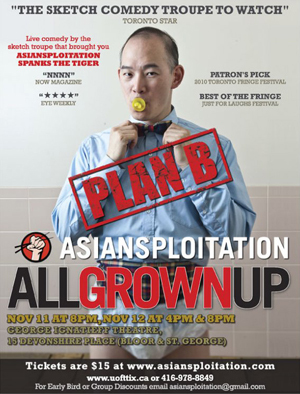 Reel Asian is co-presenting Asiansploitation’s All Grown Up: Plan B, a live comedy sketch show! George Ignatieff Theatre – 15 Devonshire Pl. Back by popular demand, Asiansploitation returns with their latest sketch comedy revue: ASIANSPLOITATION ALL GROWN UP. Winner of the 2010 Just for Laughs’ Best of Toronto Fringe, Asiansploitation ushers in a new era of comedy that is edgier, smarter, sexier, more mature and just as messy. Franco mends his broken heart, Jeff’s son moves out, Darrel is still expecting, and Lana bakes cupcakes for everyone. Growing up is never as you imagined, so it’s time to implement: PLAN B. The show must go on! Asiansploitation’s own Franco Nguyen also happens to be Reel Asian’s 2011 poster boy AND is the director of PLANTS OUT OF SUNLIGHT which is playing as part of this year’s Reel Asian Canadian shorts program Seize the Moment. Show your Reel Asian ticket stub from this show and receive 20% off your PLAN B ticket when you buy at the door! Please visit the Asiansploitation’s website to purchase tickets.